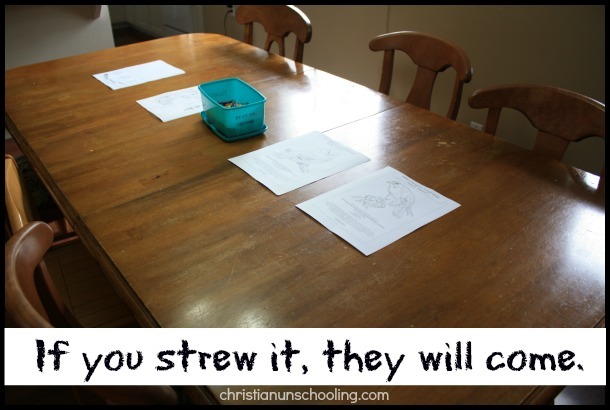 Strewing is a powerhouse tool that combats what some of the naysayers fear about unschooling. Namely the question, “How will our children know if they like something unless we force them to try it?” Usually this is in reference to something really schooly like Chemistry or European History. And you know what, there’s a kernel of truth in that sentiment. There, I said it. That’s where the beauty of strewing comes in. It’s really rather simple. We are influenced by the things put in our path. Heck, I didn’t know that I wanted to blog until I met a guy in real life one time who had a blog. If I’d never heard of a blog I would have missed out on this life-changing path. The obvious difference when it comes to the philosophy and practice of unschooling is that, even after laying stuff in our children’s paths, we don’t force them to try it. Either it will be something that they need and want at that time or it won’t. Plenty of things have been strewn on my own path in adulthood that I chose not to pursue – like scrapbooking, or college, for that matter! 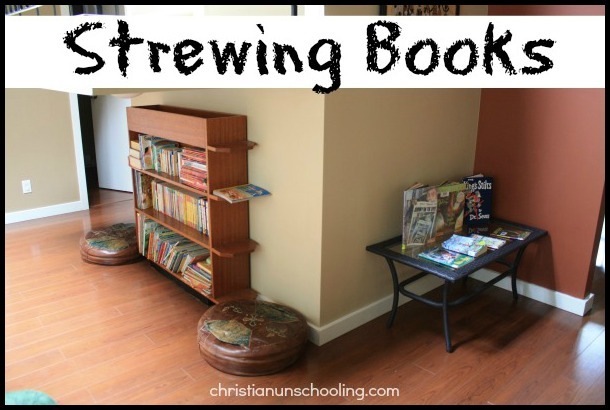 So, if you’re interested in unschooling, but in dabbling with the practice have found that your kids are “bored” and listless – perhaps you should try more strewing. But if I simply showcase a few books on the table to the right, my young boys find themselves interested in them fairly often and will either sit alone and look through them or bring them to me to read aloud. In the picture at the top of this post I had strewn some scientific coloring pages and word searches that we had gotten for free on an outing to the library where we saw a demonstration by a local Wild Life Rehabilitation Society. An experience that had been “strewn” in its own right. From that visit we learned about an upcoming open house at their facility. 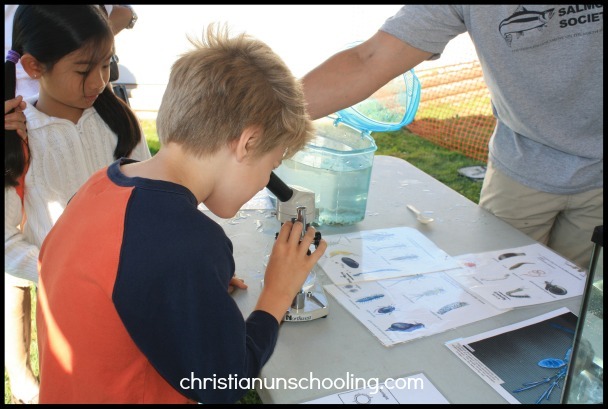 There we learned about the life cycle of salmon (including seeing preserved examples of all four stages of the egg life) and examined live samples of river life that baby salmon fry eat. 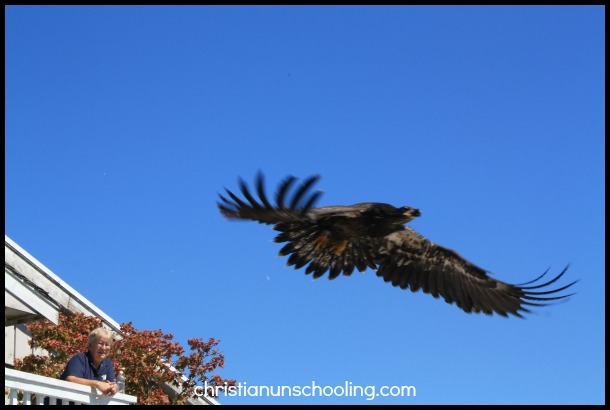 We also saw many different kind of birds of prey and saw the release of a rehabilitated juvenile bald eagle. You can see the obvious snowball effect that strewing, in all its forms, can have. And that’s truly the magic of unschooling in general. Learning begets learning.